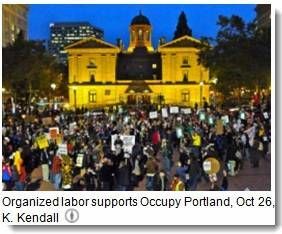 Occupy Portland began on October 6, 2011. It has maintained a steady presence in downtown Portland, a major West Coast center of commerce. The participants refuse to leave until the government addresses their grievances. Police scare tactics, planted provocateurs, and the elements are no barrier. Portland evicted occupiers from their camps on Sunday morning. The occupy forces regrouped. Drawing local support, the crowd grew throughout the day. Sunday evening, the police tried a forced eviction from the downtown area that involved mounted police, shoving and pushing, and pepper spray. The police effort failed. The occupation continues, albeit with fewer places for citizens to assemble and the expectation of more police harassment. There were police actions in other cities against occupy movements. These include Salt Lake City, St. Louis, Denver, San Francisco, and Albany, New York. Frequent Money Party propagandist, the New York Times explained away local government police actions against demonstrators as arising "amid growing concerns over health and public safety." 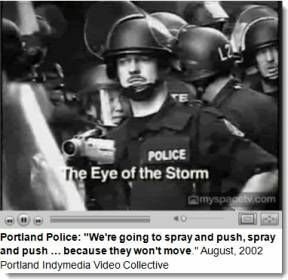 Establishment tool, Mayor Sam Adams, used this excuse to attack Occupy Portland last night. The occupy camps were not "sustainable." They had to be shut "to restore public health and safety." Mayor Michael A. Nutter of Philadelphia is massing police around Occupy Philadelphia due to his concern about "growing public health and safety concerns" Note the similarity of statements by Adams and Nutter to the New York Times talking points. What other public health problems cause mayors to amass police and attack citizens? If the mayors were so concerned about public health, they'd provide facilities and personnel to deal with public health, not mounted police beating protesters with truncheons? In case the public health excuse fails, the Portland Police Department is seeding the media with stories that Occupy Portland participants were "fashioning makeshift weapons with wood and nails, in advance of a planned move by authorities to clear their two encampments over the weekend." No use of "makeshift weapons" was reported during the police actions against protesters Sunday. The occupy movements across the country are exercising their First Amendment right to "peaceably to assemble, and to petition the Government for a redress of grievances." The Money Party can't stand that. Even worse, the occupy movement targets and methods are meeting with broad based approval. In a recent poll, "43 percent agree with views of Occupy Wall Street,"
When they use excuses like public health to stop peaceful assemblies, the mayors are liars, plain and simple, tools of the Money Party. They're following orders to disburse a movement that's just a little too real for the fascist financiers. It doesn't matter if the mayors are Democrats or Republicans. Both Adams and Nutter are Democrats. The city government of St. Paul, Minnesota was dominated by Democrats when it fabricated excuses to ban public protests at that event. They're elected officials through the contributions of the wealthy and powerful. They enjoy being on both the public and private dole. And they anticipate cashing in, like many elected officials, with a sweet position when their public service is over. The fascists financiers of The Money Party are now paying attention. They're using the normal tactics they employ against domestic assemblies of citizens who present grievances: lies, misinformation, police bullying, police attacks, claims of "safety and public health" concerns. They'll ramp up soon to massive police actions and claim that citizens caused the coming police riots.